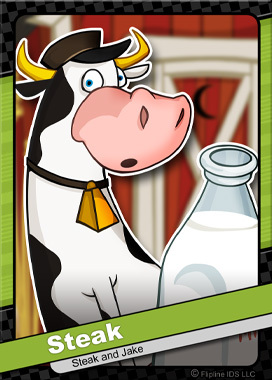 Steak is a clumsy cow who delivers milk to thirsty chickens across the land. Normally, Steak and his pal Jake travel via truck, but after the crash, they unwillingly decided to hoof it. Together they travel dangerous trails to get to each barn. Steak prides himself on delivering the freshest milk, even if it means a quick stop in an outhouse for a refill. ← Sneak Peek: Start of the day!